P.S — It’s doing the rounds this spring! I know, such an articulate way to start a piece right? 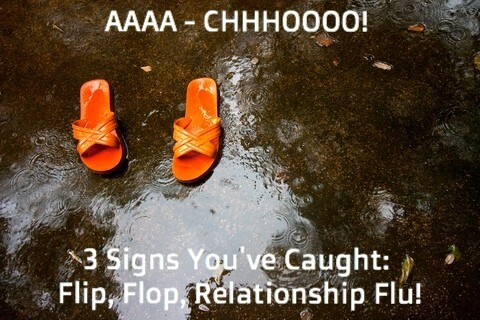 But the flip, flop, relationship flu is currently doing the rounds and I wanted to make you aware. See below so you can find out the 3 symptoms of Flip, Flop, Flu and what to do about it. Damn! One minute you feeling like wowzers! You’ve finally got to a place in your life where all is feeling really good in your relationships, and you are feeling so happy with all the work you’ve put in to your new found vibration and so thankful to reach it- but then all of a sudden something happens to flip it? Damn! Then you feel like a flop! Back there AGAIN! Now your all new clean, clear crispy vibration has got the flu, and you can feel that vibration putting a dampener on all the wonderful new shoots of possibility that were springing up in your life. Damn! You’ve got the flip, flop flu! The planet of movement and communication goes retrograde in Taurus on April 9th (and as it revs up we are kind of already in it). Taurus is ruled by Venus so basically you could see this as Venus passing the baton on to Mercury for the next stage of deep analysis. We’ve spent some time going through how we love and why we love the way we do, and now the emphasis is shifting into communication. Why is it that we communicate the way we do and what can we do to improve our communication? Both Venus and Mercury Retrogrades have great personal value, they present us with time and opportunities to give us great personal insights that can be life changing. BUT they both kick up old patterns (because how else can we review, learn and go forward)? and then we often feel like we have caught the flip, flop, flu as we catch the negative sneezes. 1. Damn! I am back here again! 2.This is useless, nothing is clearing this, it’s just too messy, it’s time to bail. 3. Everything is a failure, I am a failure, it’s all just past fixing. Those are the 3 challenges of flip, flop, flu because if you engage in that, and over identify in it then you’ve had it. Remember, the retrogrades are here to help you move in the other direction to defeatism. And boy (gal) it is time to remember this — in fact print this out and stick it on your fridge! Because we are now building up to the Libra Full Moon on 11th April. And, yup Libra is ruled by Venus, the spotlight is increasing on how we love ourselves and each other. For the next week expect the flip, flop flu to peak because it’s time to detox, it’s time to get clear on your past so you can learn from it and stop it from sabotaging affecting what you what you want to manifest. 1. I am capable of loving myself and others maturely (definition of mature is when you don’t need to hurt others that have hurt you). 2. I check in with my inner child daily to make sure that I am listening and meeting my own needs. What you would like the outcome to be, and what you have tried already. How ready, willing and able to put the necessary investment (as in money and time) to look at your reality and change it.